Sea to Summit Air Seat. Using the same technology as Sea to Summit's award-winning Air Sprung Cell™ Sleeping Mats, Air Seats are the perfect festival or sporting event companion. The sizing is generous and fits comfortably on typical stadium seating. The Air Seats incorporate Sea to Summit's new ‘mini valve’, which is a trimmed down version of the valve found on all of their pillows and sleeping mats. Its lighter and smaller profile helps this seat pack down to a carry-anywhere size. It still offers super fast inflation and deflation and the finetune pressure adjustment. Made from a durable 75 Denier Polyester top and base. 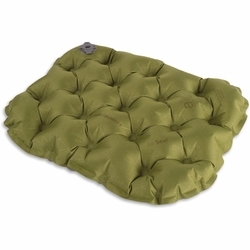 The Air Seat measures 12" x 15.75" and about 2" thick when inflated. Packs down into its own zippered pouch measuring 4.75" x 3.75" x 1.25"